The Early Girl tomato (hybrid) is a tasty, dependable tomato for short growing seasons. 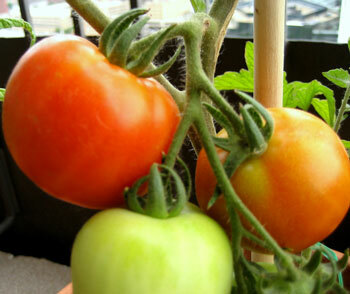 It's a popular variety among home gardeners because it ripens earlier than most other tomatoes. Time to maturity can vary, but some gardeners have reported harvesting their first tomatoes after as few as 52 days after transplant! Early Girl fruits are a uniform 4- to 5-ounces (tennis ball size). It grows indeterminate (tall) vines that will benefit from some type of staking or caging. Its flavor is good, though some mid- and late-season varieties are judged to be better tasting. Tomatoes are easy to grow from seed, but Early Girl seedlings are frequently available at nurseries. Plant after all danger of frost has passed. Because this variety is not very cold tolerant, you'll benefit by following the guidance in When to Plant Tomatoes.